Following his meeting with US Secretary of State Mike Pompeo, Kim Yong Chol, a hardline former spy chief, could also go to see Donald Trump at the White House. A top North Korean nuclear envoy began a new round of talks with Secretary of State Mike Pompeo and could also meet President Donald Trump at the White House on Friday during a visit aimed at clearing the way for a second US-North Korea summit. The diplomatic encounter with Kim Yong Chol, Pyongyang's lead negotiator with the United States, marked a rare sign of potential movement in a denuclearization effort that has stalled since a landmark meeting between Trump and North Korean leader Kim Jong Un in Singapore last year. 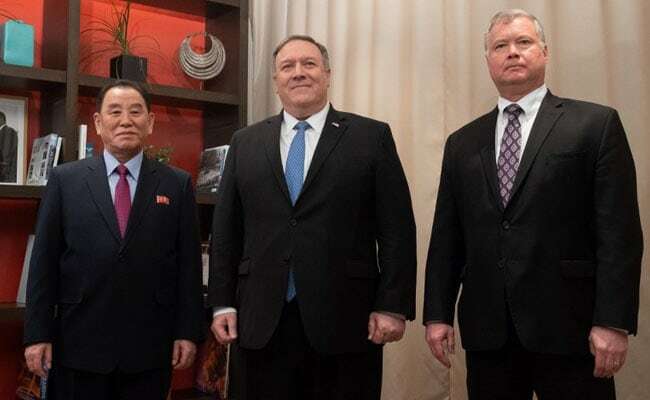 Kim Yong Chol and Pompeo, with tight smiles, posed together for photographs at a Washington hotel before heading into the talks that could determine whether the two sides can make headway. There has been no indication of any narrowing of differences over U.S. demands that North Korea abandon a nuclear weapons program that threatens the United States or over Pyongyang's demand for a lifting of punishing sanctions. Hours before Kim Yong Chol's arrival on Thursday, Trump - who declared after the Singapore summit in June that the nuclear threat posed by North Korea was over - unveiled a revamped US missile defense strategy that singled out the country as an ongoing and "extraordinary threat." Trump looking for policy 'win'? At the start of Friday's talks, Pompeo, joined by Stephen Biegun, US special representative on North Korea, stood alongside Kim Yong Chol at the Dupont Circle Hotel in front of a bookcase with a photo of slain US civil rights leader Martin Luther King Jr. prominently displayed. The men did not respond to a reporter's shouted question of whether a venue for the next summit had been selected. Communist-ruled Vietnam, which has good relations with both the United States and North Korea, has been widely touted as the most likely site.